With this in mind, my team and I got curious to hear stories of people who have actually won scholarship awards. We wanted to get insight into the common denominator that makes these students stand out. We invited sixteen past scholarship and award winners and application assessor across Africa from diverse background, discipline and level of study to reveal what they have learned in the process. One after the other, they convinced us that scholarship winners don’t win by accident; neither are they ‘Einsteins’. They are everyday young men and women who took deliberate actions and made organized set of decisions that prepared them to win. They invested their time productively to complete applications that highlighted their strengths and presented them as candidates deserving of a scholarship. Since 2009, through AfterSchoolAfrica.com, we have helped thousands of African students explore and win various opportunities around the world. With the knowledge garnered over the years, combined with that of the sixteen past award winners we interviewed, this book will challenge everything you know about accessing financial opportunities and position you as a competitive candidate. This section emphatically lays out deep and proven strategies to win scholarships based on the experiences of the past award winners and an application assessor. These African award winners hold nothing back. They pour out their hearts on what it takes to win scholarships. Hence revealing what scholarship sponsors are looking for in candidates and how to position and present your application as the right person for the award. Whether you are applying for undergraduate, masters or doctoral scholarships, or fellowship, internship, or entrepreneurship award programmes, you will find the information in this part of the book revealing. This other section of the book will expose you to up to 1,400 opportunities around the world; from scholarships and fellowships to Entrepreneurship, internship and professional programs and more competitions. Programmes in this section have a combined value of over seven hundred million dollars ($700,000,000). These opportunities are laid out by study destination, nationality, programme type and level of study. Each listed program has the following feature: title, category, description, application deadline, eligible African countries, field of study, eligibility criteria, duration of program, value of program and link for more information to apply. You will find scholarships awarded to students with special skills, talents, qualifications, or financial needs; who are interested in a particular field of study (engineering, arts, medicine, Journalism, humanities, environment etc); are members of underrepresented groups (such as women or disabled groups) or live in certain countries. Scholarship awards range from partial tuition to full tuition waivers, accommodation, books and living expenses covered by the sponsors. These programmes are offered by different types of organizations, including federal and state governments, companies, colleges, and universities, religious groups, foundations, clubs, professional associations, etc. This is specific – we include exact comments, concepts, and examples from the award winners to emphasize each point so that you can use it right away. This is instant – quickly access over 1,400 opportunities around the world worth over 0.7 Billion US Dollars. Study it at your own pace and revisit it whenever you want. And this is practical – if you’ve already tried searching for opportunities online, you want to go beyond random tactics to focus on what truly works. 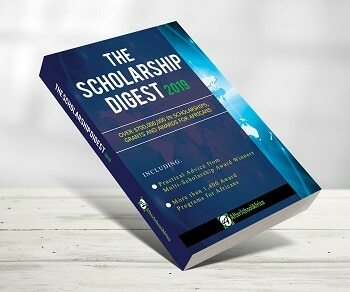 The Scholarship Digest gives you the precise, actionable steps to prepare ahead and present winning applications.